Ruins are the visible symbols and landmarks of our societies and their changes, small pieces of history in suspension. The state of ruin is essentially a temporary situation that happens at some point, the volatile result of change of era and the fall of empires. If memory is an act of creation, to who or what does the constructed memory belong when participants activate the latent meanings of a collection of objects through ritual and in response to prompts? A multiplicity of shrines in a memory palace. Micro-landscapes. Small acts of devotion offer a meditation on impermanence and loss. Rocks from a Midwestern shoreline become a game of correspondence. 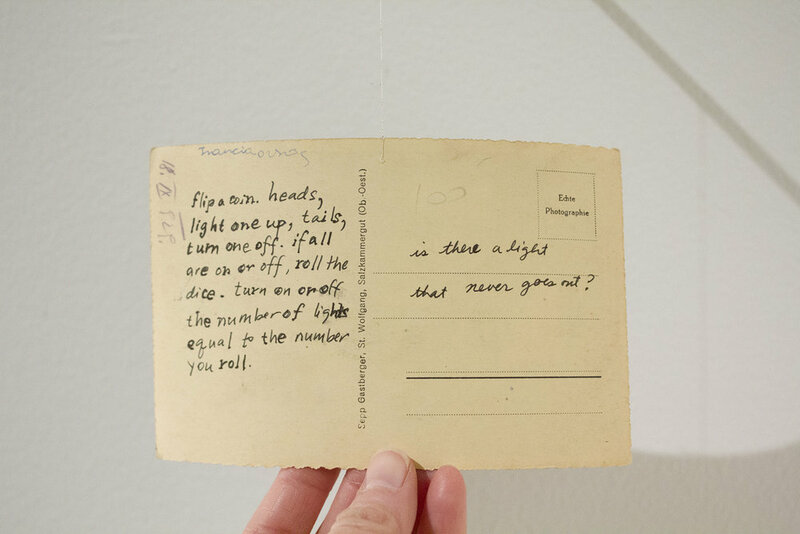 Prompts on postcards. Memory palace as structure & organizing device for a collection.